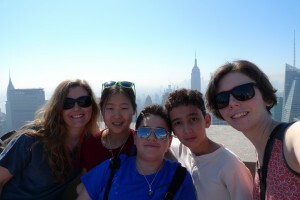 Today we slept in a little bit and then walked the two blocks to Rockefeller Center to visit the ‘Top of the Rock’. Watching three short videos, we learned about the building of Rockefeller Center, the history of the famous annual Christmas Tree (one of which was donated from Canada), and past to present day activities in the buildings, including popular TV shows filmed there. After zooming up 67 floors in the elevator in 40 seconds, we had one of the best views of New York City. 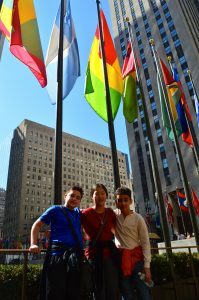 When back at ground level, the students found the flag of Guatemala in the plaza and then visited the Lego store before heading back to the hotel to get ready for the Montessori Model united Nations Opening Ceremony. 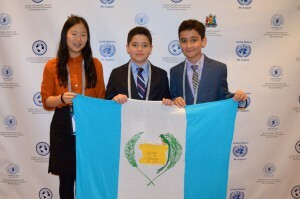 This year marked the 10th anniversary of the Montessori Model United Nations Program, which has had over 25,000 students and 5,000 educators participating over that time. 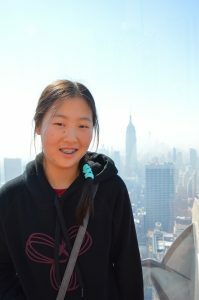 This year, 108 Montessori schools from over 15 countries were present. The ceremony began with a flag procession of student delegates carrying the flag of the country they were representing in the program. 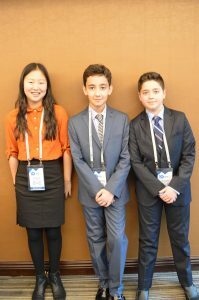 This was followed by several inspirational speakers from former delegates, UNICEF, UNESCO, notable Montessorians and engaged supports of the MMUN. After changing into some more casual clothing, we met up with the teachers and students of Boundary Bay Montessori (Our Canadian friends) and walked over to Ellen’s Starlight Diner for a very entertaining dinner. All of the staff there are hopeful Broadway Stars who preform popular songs while they serve your meal! In preparation for the actual MMUN Committee meetings the next day, the students reviewed the protocol and practiced their speeches before going to sleep.